“BACK DRAFT” I have a 2015 SL with a twisted dynamics top and a F-4 +5 windscreen. Now I have a terrible back draft coming in between the seats. It is so bad that riding in the wet at 25 mph the Windshield and dash become soaking wet. Are there any suggestions to reduce or stop that back draft? You have to get rid of the low pressure area in the cockpit. To make this problem worse you add a tall wind screen and a top. I have the 2015 with a top (UP) and a short wind screen, I cut 3 inches off of the stock blade wind screen so I could look over and not thru which helps with this problem. I really never had this problem, but with a couple of things that I did I do not have the low pressure area anymore either. We might have you covered. is it the twist dynamic top "Gull Wing" top. If so, R-Shot Windscreen will assist in this area. I had an F4 at one point when they first came out. It's a good windscreen but it does cause a big backdraft. As @FunCycle was explaining, you've got a very high pressure are in front of the windscreen (as well as what air slides around and above it). You have a relative low pressure area behind the windscreen. The high pressure will naturally work it's way toward the low pressure. On a lot of bubble canopy aircraft they put a vent at the lower rear on the canopy opposite the airflow. same principle and the amount of air that moves in from the rear is astounding. The rear windscreen as suggested by @lrobbi, will cut down on a good amount of back flow which may your best bet. Other options are to cut a vent into your F4 (like you see on Goldwings) or switch to something like a Madstad that has flow under the windscreen and breaks up the low pressure area. Contact F4 about a modified Gold WIng windshield vent. That should allow enough airflow to pretty much eliminate the problem, I'd think. Those didn't do much fox, just ask @DKF Texas who made the switch to lrobbi's TRUE windscreen. Just saying... Save your money! @silver fox if your design doesn’t workout the way you wish for it to. 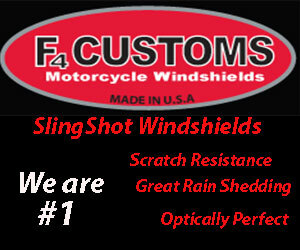 Let me know if your interested in a R-Shot Windscreen- I give a 45 day money back guarantee. That guarantees simply means if your not happy with the difference in back draft air coming through - I will refund you the purchase price. But I agree with @FunCycle you may or could try to cut down the front windshield to get better results. Edited once, last by lrobbi ( Sep 18th 2018 ). I have to disagree. I have a lexan windscreen on the front of my roll hoops underneath a slingshade with a nascar tall wind screen and it does a great job! I will say though that the tolerances between it and the body are closer than any that I have seen for sale anywhere on here. Well yeah, you've almost got an enclosed cabin there, don't ya? My idea is a Lexan sheet form cut and engraved with LED lighting. Not sure if that’s going to make it or not. I also have the stock 2015 wind screen that my SS came with. I am thinking of trying that first of all. If you noticed in the picture I sent my sun shade canvas top only covers about 18 inches on the front portion of the roof system. Another idea that I’ve seen are the side vents about 2 1/2” in diameter that draw outside air in and across the feet design for cool air circulation. This would also help alleviate some of the low pressure area?? That "almost enclosed cabin" is what was causing the problem. The huge low pressure area coupled with the natural flow of air from the back wheel up over the rear of the sling and directly into the cabin. Had we not done the lexan plate on the front of the roll hoops something would have had to go! I was/am running a rear exit exhaust which didn't help. I have posted before the video of larry's SS going down the road at 65mph and the two flags mounted on the rear of his sling blowing toward the cockpit. He has a soft top and not nearly as tall of a windscreen as what I'm running. There are ways to combat the problem but @lrobbi 's wind restrictor is good and has gotten a lot of positive reviews and there is no better guarantee to be had. I know this all too well. Battled the same problems and compounded my issue by putting the dual rear exhaust on. My fix was two things. A complete (tightly fitting) rear windscreen and large UA rear wing. Gone are my issues. I have documented the rear windscreen I fabricated. The one sold with LED lighting has large gaps in the bottom and doesn’t remedy this problem. I really wish I could get mine replicated with company that can cut them at a price which isn’t astronomical like most other mods out there. I really like your suggestion and have already started in that direction of installing a windscreen that will be attached to the front side of the role hoops with an engraved image and lights. I had my windscreen initially placed in front of the roll hoops. It got filthy and was a pain to clean. Moved it to the rear of the hoops and it is easier to clean. Not to mention it quiets down the cab a TON. I can have conversations and my music is enjoyable. Maybe you need longer arms to help with cleaning the windscreen?? 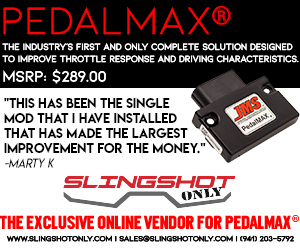 I did away with my stock exhaust about 2000 miles into my slingshot. I installed side pipes on both sides. I don’t have much of an exhaust or sound issues.